Please note: All art PLAYshops and retreats require pre-registration. Unless otherwise noted, register by phone (306) 333-4501, text (306) 331-9719 or e-mail at sue@poachedeggwoman.ca. If a deposit is required to confirm registration, e-transfers are accepted to the e-mail adddress above or cheques can be mailed to Box 128, Abernethy, Sask. S0A 0A0 are all accepted gratefully. NEW: There is a sliding scale for PLAYshops that I host- you can pay from $0 to the stated cost. Please let me know if you want to use the sliding scale when you register. All ages welcome! No previous experience needed. Two events are drop-in (no registration required). These are Scrap Basket Paper Collage held Friday, May 3rd from 4 until 8; and Create a Spring Tree held Sunday, May 5 from 1 until 5. 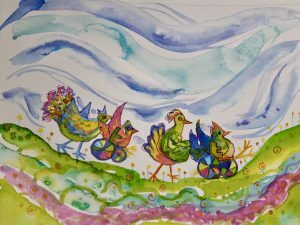 Fearless Watercolours for Beginners (ages 10 and older) will be held twice on Saturday, May 4 – a morning session and an afternoon session. Pre-registration is required. One session costs $60 (includes materials). Both sessions are $80. For more information or to register, please call the church office at 306-773-9353. A little more info is available here. 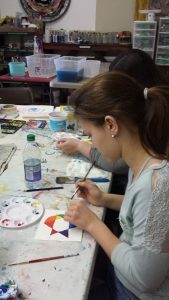 Explorations in Art for Children and Youth is an ongoing offering which takes place at Kerry Farm near Abernethy, Saskatchewan.